Tonight I received an E-mail from The Hebron Fund announcing a celebration next week that I'd really like to attend, but it would be a bit beyond my normal walking/jogging/biking distance! Official Inauguration of Tel Hebron, Tuesday October 16, 2018 at 6:00PM. Tel Hevron has always been known as one of the oldest sections of the city, but the 2014 excavation by the Israeli Antiquities Authority took the site to another level by uncovering mikvot, wine presses and pottery. A musical performance by world-renown Israeli singer David D'or will take place. 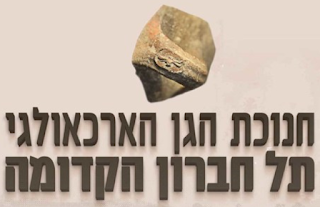 The event is sponsored by the Israel Antiquities Authority, the Israel Nature and Parks Authority, and the Jewish Community of Hebron. To register call 02-996-5333 or visit https://tickchak.co.il/2886?ref=13Bw."